OVERVIEW: A child of Hollywood royalty, actress and Star Wars icon, acclaimed screenwriter and best-selling author, Carrie Fisher has seen and done it all. Fisher shares the intoxicating tales of her life on the edge in the new DVD release Wishful Drinking. In the HBO® adaptation of her acclaimed autobiographical stage production, Fisher gives a raucous performance which slowly strips away her celebrity veneer with biting honesty. 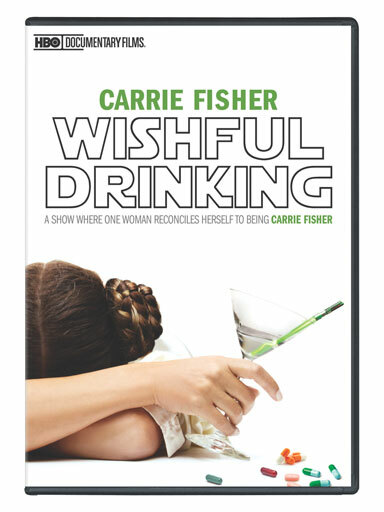 Wishful Drinking on DVD includes "My Alleged Mother," an exclusive and candid interview with Fisher's mom, actress Debbie Reynolds, along with hilarious deleted scenes and will be available on September 13, 2011. SYNOPSIS: Daughter of Reynolds and the late crooner Eddie Fisher (they were known as "America's Sweethearts" in the late '50s), Carrie Fisher is no stranger to Hollywood life. Yet despite growing up under the roof of two Tinseltown icons, her life has hardly been enviable. Faced with more than her share of challenges - her parents' scandalous and very public divorce, tragic personal relationships, drug and alcohol addiction, stints in rehab, diagnosis of bipolar disorder and electroshock therapy - Fisher has survived, and even prospered, through her resiliency, intelligence, and above all, her heroic sense of humor. In addition to Fisher's uproarious and sometimes sobering on-stage reflections, Wishful Drinking includes archival footage from her childhood and celebrated past.